We apply safe and friendly home treatments to eradicate and prevent Bee’s & Wasps in your house, shed and entertainment areas. Don’t attempt to handle destroying the hive/nest , get a professional like us to do it. Try to avoid the nest if possible. Cover Sweet/sugary drinks when outside. While most Wasp’s are considered pests & very dangerous, most bee species are vital to the environment.Unless it is an emergency, It is recommended to contact a local bee keeper to see if they move the hive to another location. 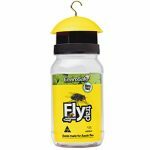 Envirosafe Fly & Wasp Trap is an non toxic, easy to use & effective way to catch flies around the house or in many outdoor locations.